I arrive at House of Blues on a rather tumultuous Sunday night as a stream of Astros fans make their way to where I presume the stadium to be. I admire the sharp contrast between these calm citizens in their bright orange and H-town shirts and my skater burnout attire. I make my way to the box office and grab a ticket, whereupon purchase the person behind the counter informs me that Wavves will be in the Bronze Peacock room and not the regular central room that I was used to showing up at. Yellowcard was playing there tonight. Alright whatever, I walk away to the right from the box office and encounter a group of adolescents in colorful attire. Everything seems to be in order I think to myself as the man in front of the double doors takes my ticket. I open one of these doors and enter the red matchbox like room that seemed to be shoddily put together. The décor was appealing with intricate although childlike paintings with frames spanned the small room. I make my way towards the middle and wait as some people onstage work to setup for the band. A few minutes later the lights dim and the band takes the stage. At the first chord that Nathan, the lead singer and guitarist, strums the adolescent horde in front of me goes into a frenzy and a mosh pit is formed. What energy these youths had trashing around and pushing those around them. Naturally I would support this fiendish behavior fueled by our host, Wavves, but I was nursing an injury and decided against joining in. Onto the actual performance, Wavves played what I would describe as a cacophony of rough but melodic sounds that I couldn’t seem to grasp ahold of. Maybe I was put off by those in attendance a mixture of some old but mostly younger kids that made me feel a bit out of place. As Wavves played songs off their recently released album V the feeling of unease didn’t pass as I was unable to discern the exact song they were playing. I found my groove as “My Head Hurts” started playing with most of the crowd beginning to sing the lyrics and head bob from outside the mosh pit where most of the older crowd including myself were standing. “Way Too Much” rattles from onstage and I was really digging the tune as those around me were singing along. The band had this unfortunate tendency to pause in between their songs and fiddle with their instruments which really killed the mood and their performance in general suffered from it. They played “Afraid of Heights,” and “Demons To Lean On” from their last album Afraid of Heights, and I was in a trance as were most of the people standing near me as we sang along with the lyrics. These definitely proved to be more favorable with the crowd as more voices joined in to sing the lyrics. The performance finished with “Green Eyes” again to the pleasure of the horde in front of me. This was an older mellow track from their King of the Beach album from 2010. What a great track to end it on. “Green Eyes” resonated with me as I headed toward the exit not sticking around to enjoy the sight. Wavves was a bit of a bummer, and not the usual type of good bummer you would expect from the surf rock band out of California. Their music is a special type of feel good high that you can only achieve by being young and reckless enjoying summer and skating around the city. Even though their performance was lackluster their music is still a worthwhile listen. 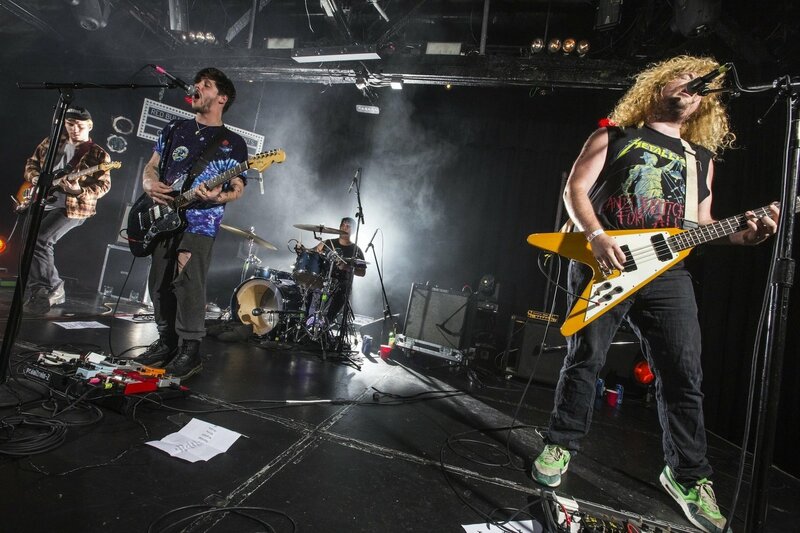 Wavves is a fantastic band that carry a nostalgic vibe to their music. As one YouTube commenter aptly put it “Wavves makes me feel like it’s okay that I hate life so much,” what a brilliant sentiment truly embodying the general ambiance that the band creates. Their music is about depression, relationships, indifference, friends sucking, and just life being a drag but they present these usually grim subject matters in an upbeat and melodic fashion. Next Rae’s Raves: Demi’s Confident, Selena’s Revived…What Else Is Happening! ?